In the Catholic Directory of 1837, Mungret parish is referred to as Loghmore. In the same year the parish name was changed to Mungret. According to Lewis, the civil parish of Loghmore comprised of Crecora, Mungret, Knocknagall and part of Kilpeacon, with chapels in Crecora and Mungret. The name Mungret is supposedly derived from the Irish Muine Gairid, meaning 'the Short Hill', or 'the Short Thicket or Grove', although according to 'Limerick, the Rich Land', this definition was a guess by John O'Donovan in 1840. Other Irish forms of the name are Imungram and Moungairid. Crecora is derived from the Irish Craobh Comhartha, which means 'the sweet scented branch' or 'the tree of the sign'. According to local tradition, a whitethorn bush was growing 300 yards north east of the old church. Pilgrims used to hang signs or tokens from the branches. The old church took its name from this bush. 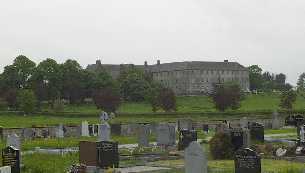 A diocesan college was opened in Mungret in 1878, and was later taken over by the Jesuits. The bell of Mungret was dug up at Loghmore near the abbey.